Against dramatic views of the downtown skyline and Interstate 10’s constant hum, second graders at 24th Street Elementary School plant and water vegetable seeds. An older child takes a soil sample for pH testing. A small class gathers beneath a pergola to discuss crop rotation. This scene and others like it are becoming common at schools across the county, helped by nonprofit groups such as the Garden School Foundation and EnrichLA, which are connecting children to the food they eat. More than 700 L.A. County schools have installed gardens, with local chefs lining up to support them. “It’s their space to experiment with,” says foundation director Julia Cotts of 24th Street’s acre and a half of gardens. Children collaborated with their parents in the creation of a Latino heritage area, which boasts tree spinach and epazote. Over at a native medicinal plot, mallow, mugwort, and several sage varieties sprawl across the ground. Chefs including Evan Kleiman, Mozza’s Nancy Silverton, and Cooks County’s Roxana Jullapat periodically step away from their stoves to conduct cooking workshops. Jullapat believes school gardens are “impacting where it counts” and raises funds through Bakers Will Bake, an annual sale of pastries at the Hollywood Farmers’ Market. This year’s event, to be held April 13, benefits the Garden School Foundation. At Thomas Starr King Middle School in Los Feliz, Tomás O’Grady gazes at what was once a parking lot until his EnrichLA converted it to a flourishing swath of soil in 2008. The group has since planted gardens at 54 schools. 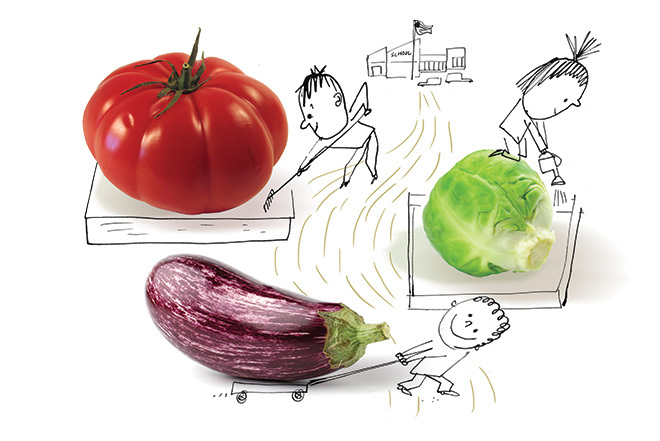 “More and more students are eating what they’ve actually grown,” says O’Grady. Parents at Grand View Boulevard Elementary in Mar Vista, another foundation campus, are seeing the results at home. Maria Alamillo de Ramirez’s daughter Maite, a fifth grader, recently replicated a meal she had cooked with an instructor. “She remembered all the steps to prepare breaded zucchini,” says Ramirez. It’s a leap from when David King established the Learning Garden at Venice High School 13 years ago. “People at the school were looking askance at what we were doing,” he says. Now they’re happily eating the results.